If you want to write a Tony-Award winning best musical, I highly recommend writer a murder mystery with a setting and score inspired by the tradition of English Musical Hall. To my knowledge, only musicals have appeared on Broadway with this pairing of subject matter and performance style, and all three took home the big prize: Redhead (1959), The Mystery of Edwin Drood (1985), and A Gentleman’s Guide to Love and Murder (2013). Last night, I had the pleasure of seeing the most recent entry in this very specific cannon, and it is easily one of the top 2 shows I’ve seen since subscribing to the KeyBank Broadway Series last year. 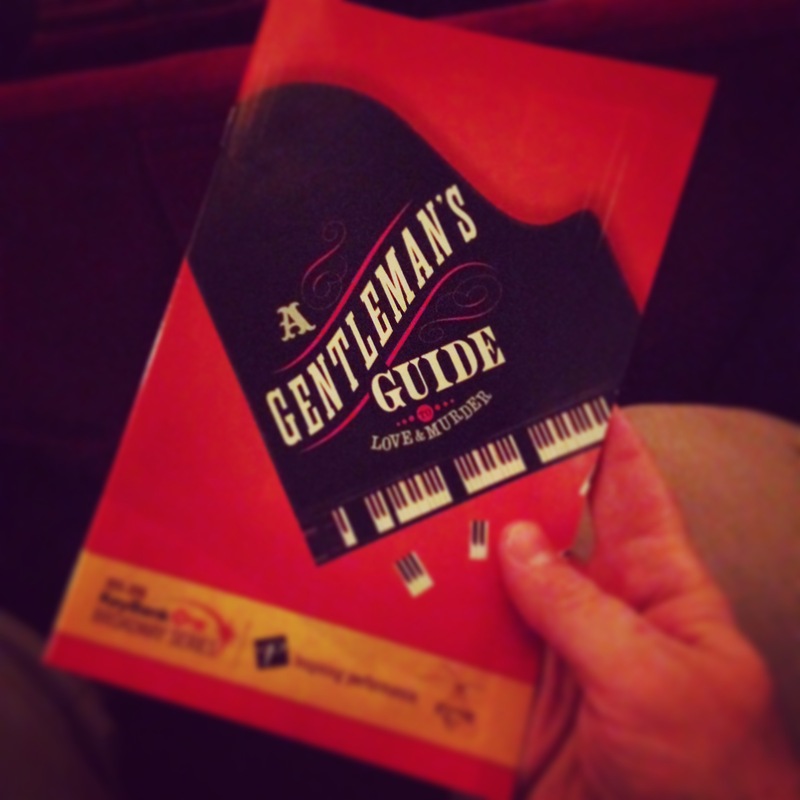 I’m actually somewhat surprised I enjoyed A Gentleman’s Guide… (aka GGLAM) as much as I did. I find “English Music Hall” to be the most grating, merit-less, and irrelevant of theatrical traditions and cannot fathom its appeal to the three American composers over the past 55 years who have emulated it. Fortunately, the score to GGLAM (by Steven Lutvak and Robert L. Freedman, each making Broadway debuts) is never annoying, which distinguishes it from its predecessors. GGLAM may not have any moment as rapturously beautiful as Drood’s “Moonfall”, but it is always pleasant to listen to. But the score to GGLAM is somewhat immaterial. The success of the production is primarily due to the consistently creative and clever Tony-award winning staging by Darko Tresnjak. Every moment is precisely conceived and executed, with even the smallest hand gestures delivered with style and perfectly timed to as to read to the back of the Connor Palace (a house three-times larger than GGLAM’s Broadway home). This specificity and wit is perfectly exhibited in their spot-on Tony performance. A small proscenium (designed by Alexander Dodge) sits center stage and is a fun-house of a playing space. Scenes seamlessly flow in and out of this toy theater. Its red curtain will descend so a scene can play in front of (or beside, or practically on top of) the mini-stage. Every time the curtain rises again, the setting revealed is whimsical and visually striking. The setting contains many tricks and surprises that are revealed throughout the evening (but won’t be revealed here). The staging is completely fluid and never repetitive, making the 2.5 hour + intermission show feel like a 90-minute one-act. The cast is uniformly excellent. All exist in a single, idiosyncratic, universe. All possess strong, pitch-perfect singing voices that fit the music’s style while still sounding pleasant to contemporary ears. All have wonderful comic timing. Kevin Massey as Monty Navarro makes an earnest and appealing serial killer that you legitimately root for. Kristen Beth Williams and Adrienne Eller each excel as the two women he loves (and love him in return). Most impressive is John Rapson, a phenomenally talented singer actor at the beginning of what promises to be a notable career, who plays all eight members of the D’Ysquith family who Navarro must kill in order to become an Earl. GGLAM may not have a deeper level beyond being thoroughly entertaining, but it is clearly brimming with intelligence and mastery of craft. Is there such a thing as intellectual fluff?